How about an exciting vacation in Crater Valley, just outside Mercury, Nevada. Explore hundreds of exotic craters right here on Earth. 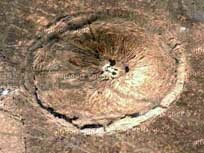 Oh, one thing you may want to consider is that they’re not natural craters – they’re underground explosive testing craters. Perhaps you rather just explore with Google Maps satellite view. This entry was posted in Uncategorized by topmen. Bookmark the permalink.